Boo! Click here to play! It's Halloween and the dead have returned to prowl the surface of the earth. Round up the monsters for a chance to bring in treat bags full of cash! There are plenty of ghouls for you to track down, but you'll definitely want to focus on Dracula. Spin two to five of this symbol and you'll bring in up to 10000 times your line bet. Not only that, but this blood-sucking vamp also acts as a wild symbol and will double prizes when he appears in a winning line. Some say that the ominous black crow is never a good sign; well it is in this spooky game. Two to five will get you up to 2000 times your line bet. The rest of the ghostly gang will be haunting the reels, so gather up the Headless Horseman, Bigfoot, Frankenstein's Bride, The Mad Scientist, the Mummy, the Wicked Witch and a few others for a chance to bring in plenty of green. Frankenstein is also on the loose. He acts as a scatter and will trigger free spins if you can catch him three or more times on the reels. Get ready for some ghost hunting in this creepy game. 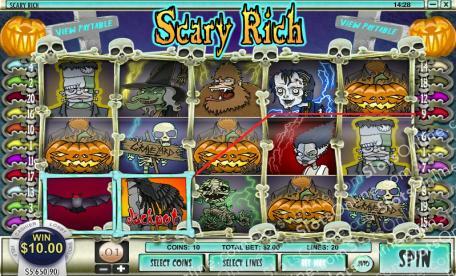 Gather the ghouls for a Halloween celebration and a chance at a hefty prize! The freaky Frankenstein acts as a scatter symbol. Spin three or more of this monster and you'll trigger 10 free spins. Free spins feature expanding wilds and and multipliers. Dracula acts as a wild symbol. Spin two to five of him and get up to 10000 times your line bet. He will also double prize money when he appears in a winning combination. During free spins, he will only appear on reels 1, 2 and 3.